Thought I would do a challenge today! This card will be entered into DL.ART, Thankful Thursday Challenge. You have to use purple and one other color, I have two tones of purple and white, although the darker purple is kind of looking black, but it is purple!! 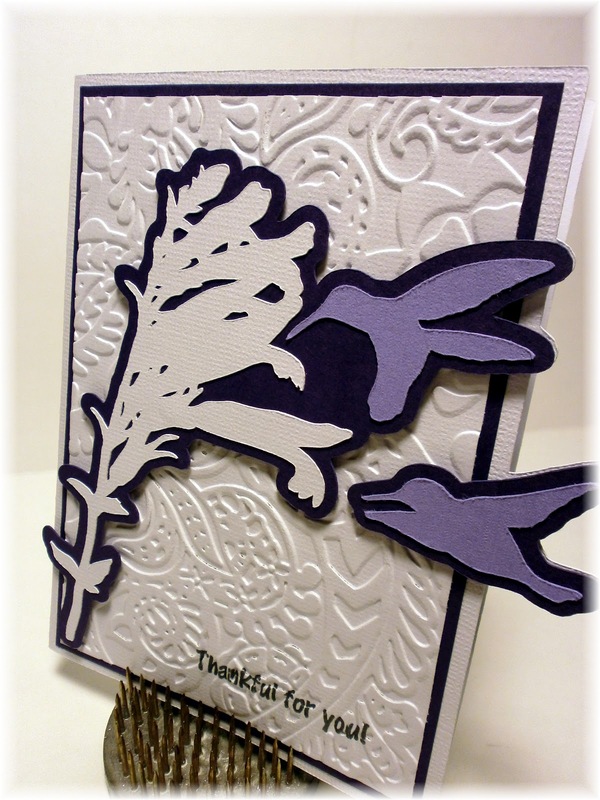 I hope you enjoy my card and if you have the time, enter into the Thankful Thursday Challenge! 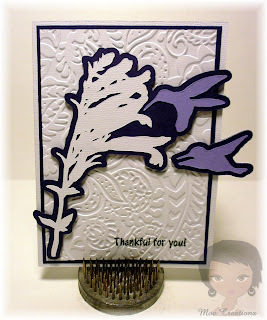 Sentiment - Cardz TV Stamps "Thankful for You!" so lovely. hubby is going to blush. I have sent you an email, please send me your mailing address so I can get your prize out to you! You will have until February 24th. Melissa this is such a beautiful card . I love the embossing folder you used. It is so elegant looking. Thank you for linking up to DL.ART Thankful Thursday. Hi, Melissa! Wow, what a beautiful card, my friend! Really love the embossed background and 3-D effect -- great challenge card!!! Thanks for dropping by, always a pleasure! This is wonderful! 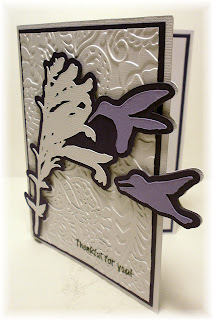 I love the colors, the cut and the embossing. I love it! just beautiful, MO! and thank you for hopping along with us during carri's birthday hop! This is gorgeous! I love the purple and white with that fabulous embossing! Very pretty-love the embossing:) Looks fabulous!! Thanks so much for following me on Blog Lovin! Hi, Moe! I signed in as a Linky Follower but I don't see me; I just keep getting a message that says you've already signed onto this blog. When you have a moment just let me know if I'm on your Linky dashboard; if not, I'll come back and try again! Such a beautiful card, I just love purple!